The University of Chicago Press has just published a new edited volume entitled After Freud Left. Edited by John Burnham, the volume includes contributions from a number of leading scholars on the development of psychoanalysis in the United States following Freud’s visit to Clark University in August and September of 1909. The Press describes the book this way. There has been a flood of recent scholarship on Freud’s life and on the European and world history of psychoanalysis, but historians have produced relatively little on the proliferation of psychoanalytic thinking in the United States, where Freud’s work had monumental intellectual and social impact. 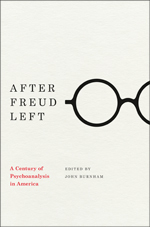 The essays in After Freud Left provide readers with insights and perspectives to help them understand the uniqueness of Americans’ psychoanalytic thinking, as well as the forms in which the legacy of Freud remains active in the United States in the twenty-first century.